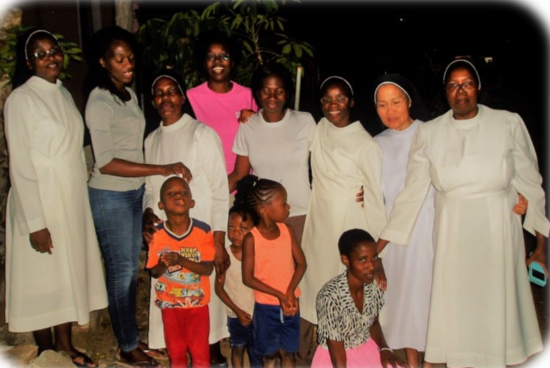 Our Tsumeb Community is blessed with its first three Oblate-candidates: Mrs. Nancy Nanatjie, Mrs. Elizabeth Kamari and Mrs. Scholastica who has a 7-month-old son called Benedict. Although they are a small group, we are happy to have them as associates of our community. They are faithful Catholics who attend Sunday and weekday Masses. At times they join the Sisters in praying the Divine Office and during the Adoration of the Blessed Sacrament especially on Sundays. They are eager to learn who the man of God St. Benedict is. On February 19, 2018, our community together with Sr. Remedios de los Reyes OSB who just arrived from Okongo, and our three Oblate candidates gathered in St. Barbara Hall after Vespers. Sr. Remedios gave a brief introduction of the Oblates Program of our Priory and essential information on how to become an Oblate. She gave a short biography of St. Benedict who is a man of prayer and miracles, and a man of love and peace. She recounted the first miracle performed by St. Benedict after intense prayer, thus, encouraging us to be prayerful missionaries like him.